It’s a shame that most visitors to Lisbon will miss the visual spectacle afforded those who arrive by train from the south of Portugal. These fortunate few catch their first glimpse of the city’s historic center from the Ponte 25 de Abril. This 45-year old suspension bridge ranges 230 feet over the Tagus River and provides a dazzling panorama that takes in most of the fabled city’s key landmarks. Like a jewel box spilling its precious contents, it offers a stunning preview of what’s to come. Seja bem vindo à Lisboa! Welcome to Lisbon, a European destination that for far too long has taken a back seat to such iconic cities as Rome, Paris and London as a prime tourist destination. Those who decide to take a chance and pay a visit will quickly be asking themselves: Why did it take so long? At the river’s edge, the vast Praça do Comércio(Commerce Plaza) trumpets its imperial lineage through grand, ornamented portals and the yellow-tinted façades of government buildings. The setting remains virtually unchanged from centuries ago when Vasco Da Gama, Pedro Alvares Cabral and other adventurers set sail to conquer exotic lands that became today’s Brazil, Mozambique, Goa, Macau and other far-flung outposts. In the process, they made this small country a maritime empire, one of the world’s greatest economic powerhouses. Fanning inland from the praça, a seashell-shaped valley embraces most of the city’s points of interest. The grid-like formality of the Cidade Baxia (the Lower City) gives way dramatically to the architectural capriciousness of the Bairro Alto (Upper District), the center of Lisbon’s Bohemian nightlife. The silhouettes of grandiose cathedrals, palaces and fortresses command the upper reaches of surrounding hills while the expansive greenery of Parque Eduardo VII, regally capped by a fluttering, gigantic red and green Portuguese flag, forms a stunning backdrop. Not being the center of political and economic influence it once was, the Lisbon of today enjoys a pace of life that is decidedly unhurried. Visitors will be immediately impressed by the informality of their Portuguese hosts, from taxi drivers to barmen and waiters. 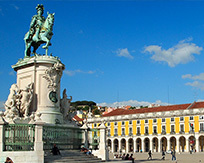 Lisbon’s cosmopolitan flair is due in large part to its ongoing relationship with its former colonies. Strike up a conversation with a maître d’ in any of the city’s fashionable sidewalk cafes, and chances are good that he’s a Brazilian who will quickly introduce staff members who share his nationality while pointing out others from Angola and elsewhere. Moving around the city, visitors will soon be reminded of the old axiom that travel isn’t just a destination but the constantly varying and entrancing details of the journey itself. In Lisbon, getting from place to place affords an opportunity to do a bit of time travel. Urban explorers scurry to hop onboard one of the century-old trams that still creak along well-worn tracks through a pastiche of unsung neighborhoods and must-visit sites, including Largo da Sé, site of the city’s grandiose cathedral built in the 12th century. For the leg-weary, Lisbon offers three funiculars---small, antique, train-like conveyances that move up and down steep slopes---and one vintage public elevator that make travel between the city’s upper and lower levels something of an adventure. Above all else, Lisbon invites a mood of relaxation, and the temptation to linger a while over a meal. Why resist an opportunity to try just one more sumptuous pastry such as pasteis de nata, a hearty bowl of caldo verde, or bacalhau---salt cod, the national dish, served in an infinite number of ways, all worth trying. When cocktail time arrives, Portugal’s highly regarded wines are an obvious choice, particularly the ubiquitous port and lesser known madeira. But don’t pass up an opportunity to savor a Lisbon original, the ingenious blending of sour cherry juice and sugar cane brandy that results in a liqueur known as Ginja. In its own way, this rarity of the beverage world is a perfect metaphor for Lisbon itself---quaint, unexpected, and wholly satisfying.